A confluence of events brought Dr. Alan Merten to George Mason University, and an even greater confluence of events caused him to stay for sixteen years. 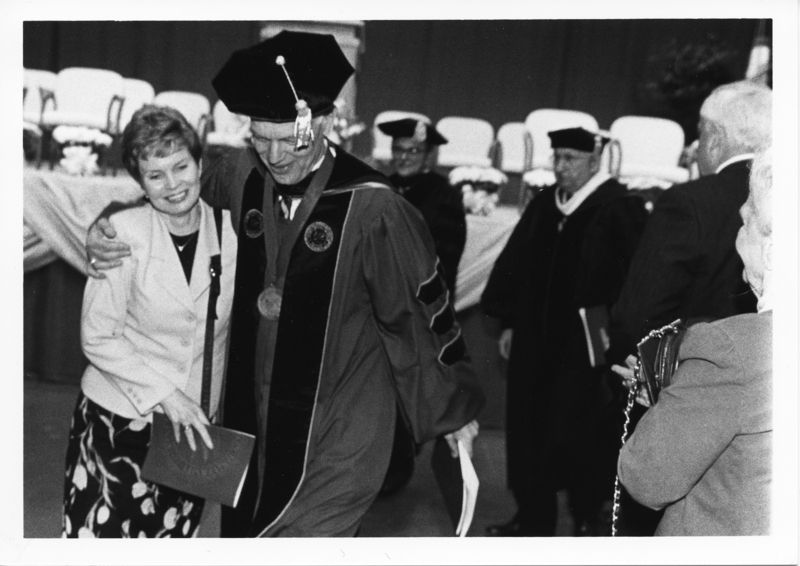 Dr. Merten’s journey to become President of the University began long before his appointment in 1996. Dr. and Mrs. Merten were married in Northern Virginia in 1967 and followed the growth of the University throughout the years. He could have had no idea that thirty years later he would lead the University through an unprecedented stage in its development and be marked as one of the greatest contributors to the young school’s already-rich history. Alan Gilbert Merten was born and raised in Milwaukee, Wisconsin, where he attended both the Universities of Wisconsin at Milwaukee and Madison in his undergraduate years to study mathematics. He joined the Air Force shortly after graduation, and his first assignment was to get his Master’s degree from Stanford University in Computer Science. Upon completing the degree, he worked in the Pentagon’s computer center for three years and served as a military aid to President Lyndon B. Johnson. He met and married his wife, Sally during this time and after completing these assignments, he returned to the University of Wisconsin Madison and earned his doctorate in Computer Science. His time in the Air Force had piqued his interest in computing—he enjoyed research and teaching, so he thought becoming a university professor would offer the best of both worlds. Though he considered working for a big technology-focused corporation, he decided to follow the example of professors who had inspired him to teach. That career choice profoundly shaped the rest of his life. Dr. Merten’s first position was as a professor of industrial and operations engineering at the University of Michigan. There he developed an interest in the business applications of the computer. After his first four years of teaching, he transferred from the engineering school to the business school to teach the application of computer science to business. This eventually led to his teaching programs for business executives as well, and soon he was offered his first administrative position: Associate Dean for Executive Education and Computing Services at the School of Business. In 1986 Dr. Merten became dean of the School of Business at the University of Florida and remained there until 1989 when he accepted the position as Dean of the Johnson Graduate School of Management at Cornell University. Dr. Merten already had an established vision by the time he took office in 1996. He sought to develop a great university in the greater-Washington, D.C. area, to expand research activities to match the University’s strong reputation as a teaching institution, and to continue to establish excellent academic programs in new areas (information technology, law, policy, economics, and performing arts were already strong disciplines). Dr. Merten understood that in order for the University to not only “survive, but thrive” it was necessary to “create order out of chaos without killing the entrepreneurial spirit.” He appreciated Dr. Johnson’s approach to improving quality at Mason, but the many ideas that had been suggested by others during Johnson’s time sometimes resulted in programs, departments, institutes, and organizations that overlapped and competed with each other. Merten felt that the “let every flower bloom” mentality created the atmosphere of a “start-up company”: things were exciting, but there was a certain amount of disorder. the only ones that were going to be innovative. Existing organizations had to be innovative, too. innovation and the old entity with lack of innovation. We couldn’t do that—we couldn’t afford that. During Merten’s first year, a number of high-ranking university positions opened up and needed filling. He looked to hire about ten to twelve faculty and administrators, ranging from the Dean of the School of Information Technology and Engineering to the Vice President for Information Technology to the basketball coach. His vision to expand the University’s influence attracted one dean who had no previous interest. At George Mason, however, with “so many chairs around the table…empty, he realized that he could have influence not only in his chair, but also an influence [on] whom [else] we hired and in creating the organization.” The combination of faculty from Dr. Johnson’s tenure and the new hires appointed by Dr. Merten signified a “dramatic change in the nature of the University,” but one that was met with a positive reaction by the Mason community. Merten recognized that people believed in the institution, knew what Dr. Johnson had done and respected it, and also knew what needed to happen next. The first time, about a year or so after I got here, when that started to happen, I knew we were winning. In addition to merging departments and hiring new faculty, one of Dr. Merten’s first big decisions was to promote the concept of Mason as a distributed university: he assigned all three campuses equal status. He had also decided upon his arrival that there should be a major capital campaign; one had been proposed and started briefly in the early 1990s, but it had never come to fruition due to the period’s poor economic climate. A relatively quiet planning phase beginning in 1998 involved many changes in staff in the Development and Alumni Affairs Offices and the process of assessing each academic department’s needs. $78 million was raised during the pre-public phase, and the campaign was launched publicly on April 6, 2002, at a dinner celebrating the 30th Anniversary of the University’s independence. Merten explained to donors that “We were trying to move George Mason from good to great, from good enough to excellent, and that was going to take private money.” He believes support came because “people want to put their name on success; they want their money and name to be associated with [it].” Alumni gifts were significant, even though the alumni population as a whole is relatively young. A community of 45,000 donors contributed to the campaign, which raised $142 million by its close on September 24, 2005. Dr. Merten also worked diligently to increase the opportunities made available by George Mason’s proximity to Washington, D.C. because as a friend had told him: “[l]ocation by itself doesn’t guarantee you anything. You have to take advantage of it.” Merten felt that George Mason had begun to do that, but believed that it could do much more. He saw Mason as involved in five levels of community: technology, arts, and public community affairs of Northern Virginia; Virginia itself; the greater-Washington, D.C. business and arts community; the nation’s capital; and the world’s capital, stressing the last two as extremely important. All were vital to Mason’s growth, however: “We have a responsibility to both contribute to and draw upon those five communities, and we do”. That students appreciate the location, diversity, and programs at Mason is evident in the dramatic increase in enrollment that took place during Dr. Merten’s tenure. In 1996, approximately 23,000 students attended George Mason; by 2010, about 32,500 students were enrolled. He has noted that the percentage of undergraduates who are full-time students has increased between fifty to sixty percent, partially due to the influx of out-of-state students--from about ten percent to twenty-five percent of the undergraduate population--and the increase in the number of students living on-campus as the University has become a primarily residential institution with a residential population of approximately 7000 students in 2012. Masonvale, a large neighborhood of townhouse-style apartments for faculty and staff on the Fairfax campus, has further contributed to the residential feeling of the University. Dormitories were not the only buildings under construction; during Dr. Merten’s presidency, over twenty major buildings were built on Mason’s three campuses, including new academic buildings like the Art & Design and Engineering buildings at the Fairfax Campus (both opened in 2009), the Biomedical Research Laboratory at Prince William (2001), and Founders Hall at Arlington (2010). The Hylton Performing Arts Center at Prince William (2009) and the Mason Inn Hotel and Conference Center at Fairfax (2010) quickly became important fixtures to their respective communities. They are facilities Dr. Merten associates with a more mature university, because they serve not only students, faculty, and staff, but also the greater community. As he later stated: “George Mason’s buildings that reach into the community are part of who we are; there wouldn’t be a George Mason without [the community], [because] George Mason was founded with the belief that Northern Virginia needed a great university and that it needed to be involved in the community.” Dr. Merten takes pride in that the quality of the University—its academic programs, buildings, and campus life—has increased with demand as the University has grown, instead of the other way around. Merten felt that the increase in quality and visibility permeated virtually every facet of Mason during Dr. Merten’s sixteen year service. “We accomplished much more than I figured we would…it’s not only what we did, but how we did it, and the pace at which we did things.” One of these big accomplishments included Vernon Smith’s winning the Nobel Prize in Economics in 2002; Mason, the only Virginia school to have one Nobel Prize-winning faculty member, now had a second. Perhaps one of the greatest achievements—and one which has had a profound impact on the University—also happened during Dr. Merten’s presidency: the Men’s Basketball team’s “Cinderella Story” journey to the Final Four in 2006. Dr. Merten has called the Final Four trip timely: “[i]f it had happened earlier or later, it wouldn’t have had the same impact. We were on the map, and this really put us on the map. Local, state, national, international media picked up on it.” George Mason appeared on the front pages of newspapers across the country—sometimes as many as 200 per day--all displaying the George Mason logo. Dr. Merten acknowledged that Jim Larranaga, the Men’s Basketball coach, “did basketball right: students first, student-athletes second,” and stressed the importance of having strong academic and athletic programs: “You’d better be doing the right things at your university in regard to academics and athletics if you ever get a hit like we did, because the media is going to write about you. The media has got to fill in either time or space—if you’re as hot as we were, they’re going to fill in good or bad; we kept them filling in with good things and they kept printing more and more.” Papers like the Wall Street Journal and the New York Times asked for more and more information about the school, and Mason sent articles, brochures, letters, and interviews to them and all over the country, garnering publicity unparalleled in the University’s history. It also imbued George Mason with a spirit that has never left. Even though Dr. Merten will no longer be the face of the University beginning July 1, 2012, his legacy will link him closely with George Mason forever. Browse items pertaining to Dr. Alan G. Merten.